If you run in the woods vs. the treadmill, there are precautions to take to stay safe. Exercising outside is usually more appealing than the monotony of indoor workouts. However, the fear of running outside alone can prevent a person from lacing up those running shoes. There are plenty of completely valid reasons to fear a run in the woods alone or even with someone else. There are way too many horror movies, suspense novels, and victim shows to discount a solo run in the woods as a concern. 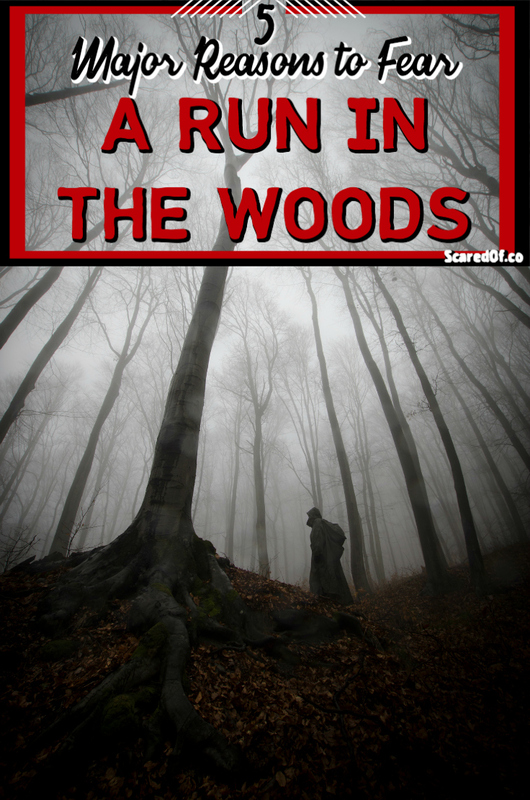 Here are just a few reasons to fear a run in the woods and what you can do about it. Does running in the woods make you think of the intro to an episode of Criminal Minds? I don’t care where you live. A secluded, wooded area is the perfect hunting ground for psychopaths. Bring a friend. I don’t think anyone should run in the woods alone. Grab a workout buddy or at the very least a ferocious dog. In addition to the buddy system, bring an ear-piercing whistle, pepper spray, and even a small weapon if you’re comfortable using it. There are also apps to notify others of your whereabouts. If you’re ever in an area where you don’t feel completely safe, send an alert to loved ones so they can track you. As soon as you’re in the clear turn it off, so everyone knows you made it. There’s another app that allows you to hold down the screen until you feel safe. Should you let go at any time, the authorities will be notified with your GPS coordinates. Stinging flying creatures are not only an annoyance but possibly a danger. If you’re allergic to bee stings or have no idea how you react, it’s a legitimate fear. Here in the Midwest ticks are a reality, too. It seems like the odds of tick bites grow every year. Unprotected animals get ticks in their backyards. Even humans gardening come in with tick bites. Protect your skin if you choose to exercise outdoors. A lot of people go for natural, but my paranoia is only settled by chemical bug sprays. Your call! Galloping through the forest like a gazelle and bam – trip on a twig. Your graceful stride turns into a sprained ankle. Sorry, that’s how my mind works. Injury is another huge reason to never work out in the woods by yourself. Make sure you have your phone with backup charger, excellent running shoes, and a tiny first aid kit. Run in populated areas. If you have a nature trail near you that attracts other fitness enthusiasts, help is never far. READ NEXT: 10 Ways to Keep Bugs Away During an Outdoor Run! If you’re scared of a run in the woods in general, chances are good you’re not tying your gym shoes without checking the weather. Be sure to check the full forecast in your area. Look at the radar to see if there’s even the chance of a storm to whip in mid-run. You’re not running with a backpack like a hiker, so you want to avoid lightning storms and other dangerous weather. Choose paths that never take you too far from your car. What else lives in the woods in your area? Where I am in the Midwest, there’s nothing too intimidating from the animal kingdom. I’m more concerned about the insects. A whistle can scare off anything larger. If you reside near bears or mountain lions, my paranoid self suggests you hit the gym. Go home and do a Beachbody workout. I wouldn’t even mess around with anything that I’ve visited at the zoo. Chances are if you live somewhere like this you already have the proper training. Overall, go with your gut. If something feels “off” on a run in the woods, cut it short and head home. Don’t wear headphones so you can stay alert. Let the sounds of nature soothe your mind while you jog. What are your main concerns about a run in the woods?